Can observations of the ocean help predict the weather? It has long been recognized that there are strong interactions between the atmosphere and the ocean. For example, the sea surface temperature affects what happens in the lower boundary of the atmosphere, while heat, momentum and moisture fluxes from the atmosphere help determine the ocean state. 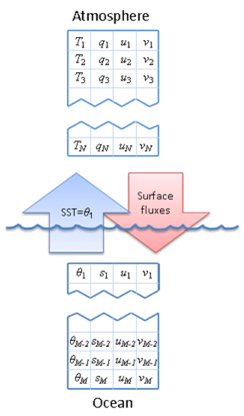 Such two-way interactions are made use of in forecasting on seasonal or climate time scales, with computational simulations of the coupled atmosphere-ocean system being routinely used. More recently operational forecasting centres have started to move towards representing the coupled system on shorter time scales, with the idea that even for a weather forecast of a few hours or days ahead, knowledge of the ocean can provide useful information. A big challenge in performing coupled atmosphere-ocean simulations on short time scales is to determine the current state of both the atmosphere and ocean from which to make a forecast. In standard atmospheric or oceanic prediction the current state is determined by combining observations (for example, from satellites) with computational simulations, using techniques known as data assimilation. Data assimilation aims to produce the optimal combination of the available information, taking into account the statistics of the errors in the data and the physics of the problem. This is a well-established science in forecasting for the atmosphere or ocean separately, but determining the coupled atmospheric and oceanic states together is more difficult. In particular, the atmosphere and ocean evolve on very different space and time scales, which is not very well handled by current methods of data assimilation. Furthermore, it is important that the estimated atmospheric and oceanic states are consistent with each other, otherwise unrealistic features may appear in the forecast at the air-sea boundary (a phenomenon known as initialization shock). However, testing new methods of data assimilation on simulations of the full atmosphere-ocean system is non-trivial, since each simulation uses a lot of computational resources. In recent projects sponsored by the European Space Agency and the Natural Environment Research Council we have developed an idealised system on which to develop new ideas. Our system consists of just one single column of the atmosphere (based on the system used at the European Centre for Medium-range Weather Forecasts, ECMWF) coupled to a single column of the ocean, as illustrated in Figure 1. Using this system we have been able to compare current data assimilation methods with new, intermediate methods currently being developed at ECMWF and the Met Office, as well as with more advanced methods that are not yet technically possible to implement in the operational systems. Results indicate that even with the intermediate methods it is possible to gain useful information about the atmospheric state from observations of the ocean. However, there is potentially more benefit to be gained in moving towards advanced data assimilation methods over the coming years. We can certainly expect that in years to come observations of the ocean will provide valuable information for our daily weather forecasts. Smith, P.J., Fowler, A.M. and Lawless, A.S., 2015. Exploring strategies for coupled 4D-Var data assimilation using an idealised atmosphere-ocean model. Tellus A, 67, 27025, http://dx.doi.org/10.3402/tellusa.v67.27025. This entry was posted in Boundary layer, data assimilation, Numerical modelling, Oceans, Weather forecasting. Bookmark the permalink.